Hi all! Hayley Snow here. I am sure you are all busy with your barbecues and red white and blue desserts and fireworks, but if you have a minute, I thought you might be interested in how we celebrate the Fourth of July weekend in Key West. First of all, key limes are in season so of course there's a Key Lime festival where Miss Key Lime is crowned and where my pal David Sloan makes the biggest Key Lime pie in the world. That guy is crazy, but you can join in the fun for a two dollar donation to defray the cost of the ingredients. Miss Gloria and I are throwing a big dinner party tonight because everyone likes to watch the fireworks from Houseboat Row. Here's the menu we came up with. Do you think we went a little crazy with the Key Lime theme? Follow Lucy on Twitter, Facebook or Pinterest...for all the news on the Key West food critic mysteries! Rigatoni and sausage was my fourth of July favorite food! Short ribs was my favorite holiday food. It would have been Key Lime Pie, except we didn't have dessert. My husband loves key lime pie. We had some great pulled pork. The key lime sponge cake sounds wonderful. I made a new recipe for 4th of July. It was a hit: Bacon Bourbon Apple Pie. Anything cooked on grill tastes good. I had gourmet pizza from my favorite local pizza place! I had smoked salmon and cream cheese pinwheels. They were so good! Grilled hamburgers and hot dogs were good, but the watermelon was best! We had Swiss Chalet chicken. Yumm. Sadly, all the Swiss Chalet restaurants around here closed-but you can get the sauce in a packet in Canada! My mom's neighbor crosses teh border all the time and got her some (she also gets it online). We bought a rotisserie chicken, made the sauce and had it with french fries. Delicious! Who knew there were more recipes for limes. 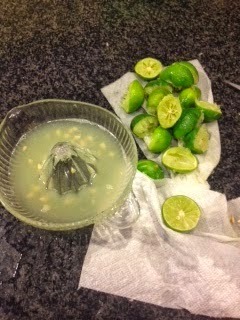 I was only familiar with the tasty key lime pie and as the ever popular addition to a margarita. Yum! Deviled eggs were my summer treat for the weekend. I love Key West and Lucy's series. I'm reading the newest Key West book right now. Great series. I had Pad Thai yesterday. Went shopping with my son and we stopped for lunch. Love that stuff. Have enough for a meal for today. Servings are big. Barbequed chicken and homemade cheesecake using the recipe my other taught us. Very rich,but the memories it evokes are special. The Key lime Parfait looks delicious. A really good lemon pie---but I would rather have had a key lime pie. My favorite fourth of July food is my pasta salad. I make it every year. This holiday weekend I've been bingeing on Northeast Sweet cherries - they are just the right balance of sweet & tart! Yum! I hope everyone has a wonderful holiday weekend with lots of yummy key lime recipes and some really wonderful cozies! My favorite thing I eat this weekend was Marinated Cucumbers, Onions and Tomatoes! My husband loved it too! Key Lime Pie is my absolute favorite dessert! Followed close by Pineapple Pie! I ate a delicious pasta salad. Favorite thing this weekend - Sonic's new Garlic Parmesan Cheesy Bread Dog. key lime anything is my favorite flavor. I had key lime yogurt ice cream yesterday. i plan on trying that key lime sponge cake. yummy! Forget what I've eaten! I want one of everything you mentioned! Jalapeño and cheese chicken burgers. Yummy! the best thing I've eaten all weekend is FRIED CHICKEN!!!!! My husband and I are enjoying the weekend being alone. It hasn't happened for a while so we are having a vacation. We also have not doen much cooking. Just found leftovers in the fridge and freezer. But your menu looks so good! Yum! Grilled steaks (boneless chuck eye) done by DH so I didn't have to cook. The best thing I ate this weekend was a wonderfully seasoned and tender piece of flank steak with potatoes and broccoli. My husband kept telling me how good the steak was. I cooked it on 350 degrees for one hour and then put it under the broiler for ten minutes to finish it off; tender, juicy and with a little crusting it was delicious!! A gri!led dessert sandwich from a food truck at Belmont park grilled apples, cheddar cheese and cinnamon. I had the best pasta salad ever at a family get together. Fabulous! I was so good I only ate salads all weekend. My special broccoli. slaw salad with cranberries and poppy seed dressings on kale and spring greens was my favorite. Lemon custard pie in a pecan crust with whipped cream and candied lemon peel for garnish. *sigh* I could have eaten the whole pie!